What’s the difference between Amish and Mennonites? Amish and Mennonites share numerous similarities. However, this question is more complicated than it may first appear, as the Amish are a diverse group, as are the churches that fall under the Mennonite umbrella. Below, a look at some similarities and differences among different factions of the Amish and Mennonites. Amish and Mennonites of today emerged from a similar cultural and religious heritage. The Amish split off from the Mennonite group in the 17th century in reaction to what one faction saw as liberalizing trends. The descendants of these early Anabaptists have formed a wide variety of Christian churches, though with certain unifying characteristics and beliefs. Though practice varies, today Amish and Mennonites share values of non-resistance, adult baptism, and in some cases plain clothing. Old Order Mennonites, or “Team” Mennonites (so named for the “team” of horse and carriage together) are closest to the Amish culturally. Old Order Mennonites dress plain, though in somewhat different styles than Amish, and also rely on the horse and buggy for transportation. Old Order Mennonites have an agricultural heritage and maintain small labor-intensive farms as the Amish do. They also speak Pennsylvania Dutch, a key cultural marker. They practice social shunning to a degree, though are generally more lenient than Amish in applying Meidung (the German term for social avoidance). Old Order Mennonites and Amish run joint parochial schools in some parts of Lancaster County. There are a number of differences between the two groups, especially when it comes to technology. Old Order Mennonites generally allow electricity in the home, as well as telephones. They make greater use of tractors as well. Old Order Mennonites worship in meetinghouses, while all but one group of Amish have retained home worship. Old Order Mennonites have developed home enterprises as the Amish have, but have tended to remain in agricultural occupations more so than the Amish. Conservative Mennonites share theological similarities with the Amish, though they accept more technology, most notably the automobile. 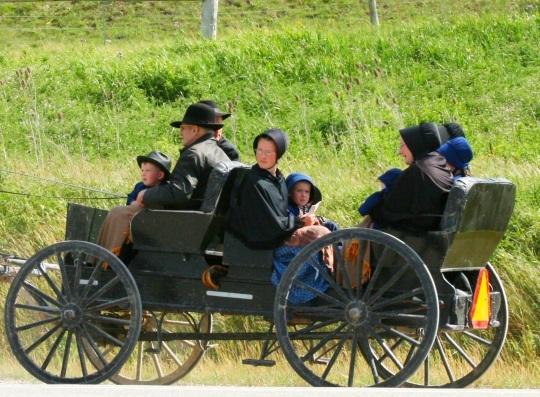 “Black-bumper” Mennonites are classified as a Conservative Mennonite group, so named for the standard dark color of their vehicles. Conservative Mennonites also maintain a degree of plain dress, including prayer coverings for women’s heads. The Beachy Amish are an offshoot group that began in 1927 when a group in Somerset County, Pennsylvania, under the leadership of Bishop Moses Beachy, split from the Old Order church over the issue of social shunning. Beachy Amish are theologically similar to Amish, and retain plain dress and somewhat similar appearance to Old Order Amish, though they accept certain technologies, notably the car and the computer. Some consider the Beachy Amish to be a Mennonite and not Amish group. There are a wide range of churches among the over one million Mennonites worldwide. Many are quite modern in what technology they use. Many Mennonites are no different in appearance than any other person in terms of dress and lifestyle, acceptance of cars, using the internet and modern technology, and going on to higher education and professional jobs. 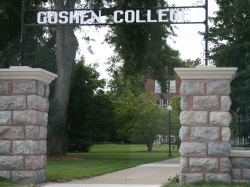 Modern Mennonites have founded a number of higher educational institutions, such as Goshen College in Indiana, and Eastern Mennonite University in Harrisonburg, Virginia. Many Mennonites exhibit a mission-oriented approach which takes them to distant corners of the world in relief and evangelical efforts, while the Amish tend to focus spiritual and charitable efforts closer to home. However, some Amish do cooperate with Mennonites on charitable efforts. Amish may contribute financially or by donating labor to higher-church Mennonite organizations, such as Mennonite Central Committee (MCC) and Mennonite Disaster Service (MDS). Though as Anabaptist groups they reside under the same religious umbrella and may share some beliefs, modern Mennonites and Old Order Amish can seem very different. At the same time, many Amish and Mennonites (particularly Old Order and Conservative Mennonites) share an affinity for one another. One sees this through their common language and similar style of plain dress, cooperation in areas such as schooling and disaster relief, as well as shared religious beliefs. Now that you know how Amish and Mennonites compare, what about Old Order Amish and New Order Amish? Or, learn about the extreme customs of the most conservative of all Amish, the Swartzentruber communities. 38 responses to What’s the difference between Amish and Mennonites? The “black bumper” term was not just derived from the dark color of the car, but from actually painting all of the shiny (worldly) and abundant chrome black. Back then, there was a premium for car colors other than black so economically black was the color chosen, but there was no “option” to forgo the chrome – hence it had to be painted black. Ahh, the 70’s! My father’s family (Horst and Martin) were Mennonites located in Maryland and Pennsylvania. I would love to have contact with them. My family visited the Mennonites almost every summer. I would love to get in touch with them again. My suggestion would be to contact the Lancaster Mennonite Historical Society for some possible direction on how to locate the area you are thinking about. Their website is lmhs.org and phone number is 717-393-9745. Maybe some other Amish America readers have other suggestions. I think there are more differences between the Amish and the Mennonites than most people are aware of. Many different Mennonite groups as there are Christian faith groups. Some Mennonite churches do not allow men and women to sit together. Some insist men have beards while others do not allow moustaches. Then you have the opposite extreme where they allow female pastors and gay marriages. Most Mennonites blend in with society and do not own farms. There is so much sterotyping out that that no longer apply. As a person raised Old Order Mennonite, and having lived directly beside an ‘Eastern Conservative Mennonite’ church for 40 years, as well as being in very close proximity to an Old Order Amish community whose members were friend of my father and employed by his business, I can tell you that there are many innacuracies in this article. In that paragraph, there are far more mistakes than correct statements. In fact the only statement that is correct is that Old Order Mennonites worship in meetinghouses. They do not allow electricity and telephones in the homes; the Mennonites who do allow such things are not Old Order, but some more-liberal church like the group who meeetinghouse has been beside my mother’s house for the last 40 years. (“Easterns” is what they are colloqially known as, but I believe they have adopted the name ‘Eastern Conservative. Tractors areused by some Old Order group, but not for pulling implements, rather they are stationary and used purely to power such things as silo-loading grain elevators. Also, the percentage of the Old Order Mennonite and Amish who remain primarily employed in agriculture are not significantly different. …and I believe you’ve stated an inaccuracy in your post: Yes, you are correct that there are many different sects of Mennonites, but none of the groups I am aware across Maryland, Wisconsin, Pennsylvania, Indiana, Illinois, Missouri and Ohio require beards — unless you count the Old Order Amish, who started out as a sect of Mennonites, but split from them in the late 1700s. On the Groffdale Conference (Wenger Mennonites): “Both telephone and public utility electricity were gradually adopted in the 1960s and later” and “By 2002, most families had telephones in their houses and were using electricity from public utility lines” (source: Horse-and-buggy Mennonites: Hoofbeats of Humility in a Postmodern World, Donald B. Kraybill and James P. Hurd, p. 211). The Groffdale Conference is larger than the other two conferences (Ontario and Virginia) plus the “Independent” OOMs put together (On The Backroad To Heaven: Old Order Hutterites, Mennonites, Amish and Brethren, Kraybill and Carl Desportes Bowman, Table 3.2 p. 69), about 14,000 to 10,000 at the time of publication. “The Groffdale Conference permits tractors for field use, but only if they roll on steel wheels” (On The Backroad to Heaven, p. 95). Additionally, bands of rubber added to tractors (“belting wheels”) have allowed them to be driven on the road at up to 35 mph: “Although such wheels are frowned upon, probably three-quarters of the farmers now have them.” Also, “Ontario Mennonites…permit full rubber tires on their tractors but regulate them in other ways” (these include a 100-horsepower limit, no cabs/rollover bars, no use on the road, and speed limit of 10 mph). On agricultural occupations, this is based at least in part on an observation made by a rather astute Old Order observer in the Lancaster County community. I believe the Holderman Mennonites require a beard. No. They don’t. I was raised Old Order, and I’m familar with the most of the different sects that fall under that umbrella. Almost none allow electricity in the home, or use tractors other than the old steel-wheeled type, and then only as a stationary power source for silo-filling, etc. They have begun in recent years many sects to allow telephones for businesses, but most are not indoors but in booths in the community, as the Amish have long done. Finally, does no one even bother to look up the history when they start to bloviate? The relationship between the Amish and Mennonites is very easy to define: Jacob Amman was a follower of Menno Simons; Ammon was a minister whose “conservative” sect parted ways with the Mennonites, as has happened dozens if not hundreds of times, based on a rules-and-practice dispute. His followers named their sect after him. Amish are a breakway sect of Old Order Mennonites. Usually they are recognized by their beards, which was apparently one of the issues that caused the split. Virtually all Old Order Amish mandate that they be worn sans moustache by all adult males; virtually all Old Order Mennonites do not allow beards or moustaches. algunos miembros estudian en la Universidad entonces cosa Amish no lo hacen entonces hay monton de Contradicciones en la vida que tenemos que desagreditar la television solo utilizo para ver noticias de lo sucede en mi pais Guatemala ya que estudio Derecho. Now would someone PLEASE point out that us Friends (Quakers) are NOT related to either group? I know that this comes some time later than Ann’s original reply. Yes, the Religious Society of Friends, referred to commonly as Quakers, are not Anabaptists and are neither Mennonite and Amish. The Quakers are varied also, some groups within Quakerism have formal ministers who speak to the congregation while still others allow God and Jesus to speak directly to the Meeting for Worship through the lips of people waiting in silence for “an opening” or a “leading” in what they call the Light. Many, although not a majority of Friends, hold what they would call a plain clothes ministry, where they feel they are lead by the Lord to dress in modest clothing, sometimes looking rather like the Amish and Mennonites in that fashion. In fact there was a comment some time ago that it was the Friends plain witness that influenced modern plain among the Old Order groups, at least perhaps to a degree. Generally though, in their founding heritage, the Friends are British, and a great deal of their popular history is American, though they are world wide as are more liberal Mennonites. I don’t think you will ever hear a conservative Amish say “thee” to his wife, but you might just hear it from the lips of a very conservative and bible reading Friend, particularly if they read the KJV bible. Yes there is a difference between the RSOF and Amish and Mennonites..
Thee isn’t related to KJV, though. It has to do with the Quaker testimony of equality. A surprising number of barely theist Friends will use it, and other forms of Plain speech. I never met anyone in amish/Mennonites I never was so quick to judge like most people that are non like these decent people that keep to them selves most of the time. I’ve passed by these wonderful people, even though they seem to be shut out by this world because of their own beliefs and culture is not fair how others treat the Amish and Mennonite. Always polite, simple and loyal to others when they are given the chance. Can’t forget how hard workers they are.they stick together but their love for things are not like the others in the world. I like their ways and sometimes I feel somehow have related similarities but I’m not called Amish just as simple and alone kind of person. Love your family and show kindness to all around. I love the these people they are GODS PEOPLE TO. … having never met anyone in either community, on what do you base your comments about their nature? I still don’t know the difference! There’s really no, or little difference between the Mennonites and the Amish. The Mennonites are the original Catholic group who broke off from that church due to a difference in belief and their (Catholics) refusal to follow traditional beliefs and practices. The Amish are a group of religious followers who are nearly identical to the Mennonites, except that the Amish refused to recognize and adopt social change and its development/discoveries/advances. Their similarities? Both groups believe in the same GOD, his direction given in The Bible, and they both refuse to keep-up (the Mennonites practices a little more acceptance) of the progression of Mankind and his abilities. Rather, both the Mennonites and the Amish prefer to stay in the past rather than receive and accept what the goodness of GOD has given us. The Mennonites were a sect of Anabaptists, a larger group who split from the Catholic church as a result of the Protestant Reformation of Martin Luther, in the 1500s. The Amish started out as a sect of Mennonites, but split from them in the late 1700s. Amish and plain Mennonites share the values of non-resistance, non-swearing, and non-litigation. In this original YouTube video, you can see some of the differences between the Amish and the Horse & Buggy Mennonites. This compares the Arthur, Illinois Amish with Penn Yan, New York plain Mennonites. It was made by Ernest Bontrager in June 2013, with a duration of 6:20. This often is not true anymore. Remember that there is a VAST difference between the various types of Mennonites. Some Mennonites are very similar to the Amish ( who of course, have variations as well); many Mennonites today however, have given up any idea of being separated from the world in any sense and would have little to distinguish them from any mainstram, liberal church. I am a African American female doing a research paper on the culture of Amish and Mennonites what I have found is that the have simple and peaceful life. I don’t go to church because most churches have false preachers and false people. But I try to live a life of goodness. It’s nice to see group of people that as we say in our culture “practice what they preach”. There is at least one Mennonite Church in Boone NC that is predominantly African American. I believe it is called the Mennonite Brethren of Boone. You may find it useful to contact them. I have not visited with this church, so unfortunately I can provide you little info on it other than it exists. My guess is that it would be a fairly “un-conservative” church, but I am just speculating here. Why do you have a problem with someone stating their cultural background? Why didn’t you question my Quakerism? Sounds like you have a problem with African Americans. I know what your intent was with the comment about practicing what you preach. However, it is also wise to be wary of legalist religious traps that ensnare and drag down the Holy Spirit’s ability to operate. Where the Spirit of the Lord is, there is freedom. Not to live as we wish, but from the entanglement of man-made religious rules. Dressing plain or avoiding use of motor cars makes no one bound for heaven. That can only come through a confession and belief in Yeshua as Lord in one’s life. Jesus spoke most harshly to the religious zealots of his time, and religion today is no more appealing in His sight than it was then. We need each to seek a daily relationship and walk with our Savior, and to allow His Holy Spirit free reign to do what He will in our lives. Be blessed as you seek Him! The Beachy Amish/Fellowship people have operated an ethnically diverse fellowship in metro D. C. area for many years Actual differences of Amish from Mennonites in general are practice of social shunning (not just from communion table)and requirement of male church members to not remove the beard (with few exceptions, not required by non-Amish Mennonites) and use of hook and eye closures on outer garments. One practical difference would be all solid colors in clothing. Also most Amish of any kind will use the Lobsang as second hymn at preaching services. I have had close acquaintence with a wide spectrum of Amish over a span of about 45 years (am in process of converting to Beachy A.) and have never found the attitude that one must be Amish to be Christian or that good works can earn salvation. That would be legalism. I find it hard to believe that in trying to describe Mennonites and Amish to folks that don’t have an understanding, no one has mentioned they are both pacifist groups – that pacifism is really the heart or foundation of their faith in its origin. All the stuff around the varying views of the evils of technology developed much later, over time. Thank you for all this good information about various Anabaptists. At this time I wish to submit some additional information. When I can I visit a local Mennonite church. They are “conservative Mennonites.” (Small “c” on purpose.) Not the Conservative Mennonites written about above, or that can be found online. These warm and friendly folks may speak Pennsylvania Dutch, but all speak beautiful English. Many of their churches are located in Tennessee, Kentucky, Illinois, and thereabouts, and now in California. This is a Plain dressing church with many plain practices. -Christmas joyfully observed on 12/25 but without the splash or special lights of worldly practice. -Electricity from a public utility is accepted as are washers, dryers, dishwashers, cell phones, electric sewing machines, irons, etc. But clothes lines for drying laundry are still common. -Worship is in a prepared place, such a meeting house, the end of a converted farm building (like ours). Our decor is very simple. There are comfortable pews, nice restrooms, and a nice little kitchen. Almost nothing on the walls. -All singing is a cappella only, with hymn books, no overhead projector. -One of our favorite catalogs is VGS, which sells Mennonite CDs of a cappella hymns. Previously CDs were not allowed. But I asked about the language tapes for missionary language study, so why not CDs that comply with our rules? So CDs are now allowed. Then I pointed out the long travel that some of our people do, visiting family in the Midwest for example. So they are going to review the rules that would affect playing CDs on the road. It is recognized this could be good in a car full of family on long trips. This says to me they are very reasonable. I’m the new guy and they listened to even me. -One of our authorities is Daniel Kauffman, a prolific author. He advises that if one must wear a watch, that it have a simple design and a black wristband. Cell phones are for talking only, not photography, and several things like that. -We wear no jewelry at all, no makeup, the ladies’ heads are always covered, they wear cape dresses, simple shoes or discreet tennies/running shoes. -One thing I like is that blue bib overalls are allowed. I’m older, fat and often do dirty work. So this keeps me comfortable and easily cleaned up. Our people do numerous jobs, so farming, while common, is not required. I for one prune trees. -Ours is a pacifist church, but I came to them late in life. I was already a veteran of the Navy. So when the subject comes up they only show a polite interest because of the many Western Pacific ports I once visited. And they are not wimpy about guns. They have their usual place as on any farm, but they are not for violence or war. So they don’t worry about it. -Baptism is not just the follow-on for conversion to Christ. It is also the membership ritual when you join the church. I have only seen it done by pouring, though some churches either use another form, or even give the baptismal candidate a choice. -We have mutual aid, and quite a lot of just helping friends & neighbors. -We have missionaries that go abroad. My late father in law, who worked for the Lord in Rhodesia, used to talk about cooperating with Mennonite missionaries, and found it very rewarding and satisfactory. -I am happy. Among the solid churches I have been with in my life, I love it here the most. It is warm, loving, peaceful, and I get fed as a Christian. I am closer to the Lord when I have more time to be active in this church. I do work on many meeting days, and they would rather that one attend at every opportunity. But I see that as only good. -The greatest prohibition of all is worldliness. We are not to be like the world, but are called out to be separate, reserved unto God. But aren’t all Christians? Michael, I enjoyed reading this. It was well-written and interesting. Thank you for sharing this! One of the four-year institutions of higher education founded by General Conference Mennonites is Bethel College in North Newton, KS. Right down the road from an Old Mennonite junior college, Hesston College in Hesston, KS. Not all Mennonites are opposed to education past 8th grade. Are their Amish in Australia that live Identtcal lives? If so; are they obviously aware that no one gets Preferential Tratment around a Passport Picture ID? I realize that the Amish People get Similar exempts as the Nations dies USA/CAN Line! Error 2: living Identical lives in Australia & New Zealand as the USA & CAN! Are their Amish in New Zealand that live Identtcal lives? If so; are they obviously aware that no one gets Preferential Tratment around a Passport Picture ID? I realize that the Amish People get Similar exempts as the Nations dies USA/CAN Line! I am an ESL (English as a Second Language) teacher in the region of Peel, Ontario. I am planning a trip to St. Jacobs to introduce my ESL adult newcomers, a bit of history of our country and familiarization with different cultural backgrounds. One of the questions that came up was, “Can anybody from a different cultural background be accepted into the Amish community”. This, is a very good question, that I have no answer for. I was hoping, you would be able to provide an answer for me. Can people of different cultural background join the Amish? Clara if by cultural background you are meaning a different racial or ethnic background, yes it is possible though uncommon. In general, outsiders joining the Amish is not common and a significant number of those who join subsequently leave after some time. There are some Amish of non-white background (Latino, African-American) though I’d suspect in most of those cases they were adopted as young children and grew up in the faith. I have also met a man of German background (German as his first language) who had joined the Amish. Both believe that fried spam and eggs make a good breakfast. The Amish like nachos as a snack. The Mennonite prefer to snack on foods from Trader Joe’s. Both believe that flossing is a good part of dental hygiene. Leave a reply to What’s the difference between Amish and Mennonites?